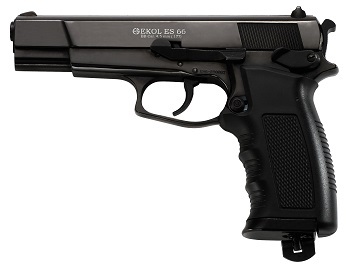 Image Below Or Add To Cart 66C ARAS BB Pistol-Black: The Latest Era of BB Guns; the Ekol ES 66C CO2 ARAS BB Gun Pistol is great for teaching or learning the basic techniques of gripping and shooting a semi-automatic Hand Gun firearm. With a precision Rifled Barrel they are accurate enough for target shooting to hone in your marksman skills. The air pistol features a 14-shot, built-in magazine with a CO2-powered BB repeater that propels BB's at a velocity of 360 fps. The magazine is designed to hold one 12 gram CO2 cartridge and the BB’s. Much like its' blank firing companion, the ARAS, the Ekol ES 66C is a precision built pistol with a bold balanced feel to it. It is made of metal, not plastic. The gloss black painted finish is flawless on this gun. The gun comes in a handy black plastic case with foam sheets to hold it during travel. Items included are the gun, case and an instruction booklet. If you are looking for a fun shooter with realistic feel and appearance, this precision built air gun is for you. Features; All metal construction with plastic grips, Barrel: Metal Rifled, Speed: 360 FPS (feet per second, Ammunition Type: 4.5mm BB's (sold separately), Ammunition Capacity: 14 round magazine, Propulsion: CO2 x 1 (sold separately), Length: 7.5", Height: 5.3", Weight: 2.15 lbs., Manufactured by Voltran/Ekol in Turkey. “This ain’t your fathers BB Gun”. 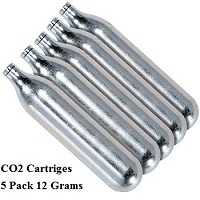 You can add CO2 and BBs in the menu below.